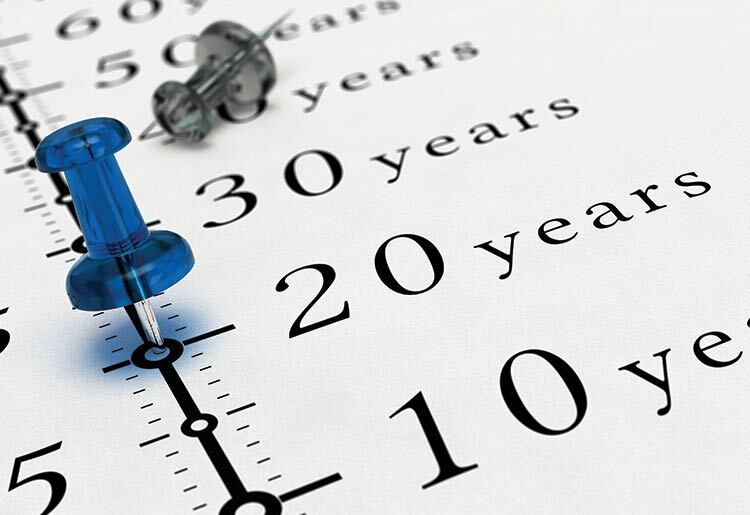 What is a Long Term Loan? What Are the Best Long-Term Loan Companies? If you need a personal loan and will have time to pay it back, a long term loan may be the best choice for you. Here's a comparison of the top 5 long term personal loans providers. A long-term personal loan is essentially any loan with a repayment period longer than around 3 years. Long-term personal loans usually offer higher loan amounts, lower interest rates, and are frequently secured to some item of collateral, such as your home or your car. Unsecured long-term personal loans will not have lower rates or higher loan amounts because the risk to the lender is still high. You might want to take out a long-term personal loan from one of the best personal loans companies to pay for a really large purchase, like a car, a house, or for ongoing education costs. Long-term loans are also good for anyone who can’t afford to make larger monthly payments. Most people think that having a bad or less than great credit rating is a deal-breaker when it comes to getting a loan. Actually, you can still get a loan but you’ll be seen as a somewhat higher risk by the lending company and this will probably be reflected in the terms of the loan. What does this mean on paper? Typically anything under 630 is considered a bad credit rating, and people in this range can expect to pay at least 25% APR. This means that if you take out a $5,000 loan at 25% interest over 5 years, you’d end up paying almost $4,000 in interest by the time the loan is paid off. If you paid it off in two years, you’d pay $1,404 in interest. In other words, while you can still get a long-term loan even with bad credit, it will make it far less economical to stretch out the repayment term due to the high interest rate. The longest repayment period available for unsecured personal loans through SoFi is seven years, and there are no secured loans available. One of the main advantages of SoFi for a long-term personal loan is its flexibility. SoFi offers both variable rate and fixed rate loans, allows you to change your monthly payment date, and if you miss a payment, they will waive the late fee if you usually pay on time. Also, if you lose your job and have trouble making payments, you can ask for forbearance, where SoFi will permit you to suspend your monthly payments. You can request forbearance for three months at a time for up to 12 months, although the interest will continue to accrue. SoFi also offers members-only social events and networking to help you find a new job. To qualify for a loan with SoFi, you need a credit score of at least 680 and to show a good amount of income left over after paying your expenses each month. However, there are no minimum income requirements or credit history. SoFi does not charge any fees for arranging the loan, processing a personal check, origination, or any prepayment fees. The late payment fee is only imposed after a 15 day grace period and is $5 or 4%, whichever is lower. SoFi’s low fees, flexible payments, and low APR make it a very good option for long-term personal loans. LendingTree is a loan marketplace which gives borrowers a number of different pre-approved loan quotes from various lenders. The range of APRs is wide – from 4.79% to 35.99% for unsecured personal loans. LendingTree offers unsecured personal loans of up to $50,000, for periods from 3 months to 15 years, and has no minimum credit score requirements. Higher amounts and lower APRs are available for long-term secured loans. LendingTree has home equity loans for up to $150,000 for 30 years at 3.7% APR. An average auto loan of $25,000 can be repaid over 5 years at 3.19% APR. LendingTree is unusual in that it also offers boat loans, RV loans, and powersport loans with no upper limit and for rates as low as 3.35%. LendingTree does not charge any fees, but prepayment charges, late payment fees, and personal check processing fees are all determined by the lender. LendingTree is a good choice for a long-term secured personal loan for people who want to compare rates before they commit to a lender. LendingClub is a loan marketplace platform that enables peer to peer borrowing. You can receive an unsecured personal loan of up to $40,000 at APRs that range from 5.99% to 35.89%, though its long-term loans only stretch to five years. LendingClub doesn’t offer any long-term secured loans, but you can turn to it to refinance your car if you have more than 24 months left to pay. LendingClub’s APRs for auto refinancing are 2.24% to 24.99%. You’ll need to have a long credit history of at least three years and a minimum credit rating of 600 to qualify for a loan through LendingClub, as well as a relatively high monthly income and low debt to income ratio. LendingClub charges an origination fee of 1-6%, $7 for personal check processing, and a late payment fee of 5% or $15, whichever is greater. However, there is no prepayment fee, and if you fall on hard times, you can ask to pay only the interest for up to three months to give you time to get back on your feet. If you’re looking to consolidate debt, or pay for a home renovation or repairs, or just need some cash flow to get through some lean times, consider taking a look at Upgrade. The company specializes in unsecured personal long-term loans ranging from $1,000 to $50,000, and can facilitate repayment terms of 3 to 5 years. Upgrade requires a minimum credit score of 620, which is lower than many competitors. In addition, it offers help repairing your credit, through financial education resources and free credit monitoring, among other tools. The application also only uses a “soft” credit check, so you don’t have to worry about it affecting your score. It’s wise to remember though that with low credit score you will face more expensive terms, including APR that can range up to more than 35%. On the other hand, because these are unsecured personal loans, you won’t have to put up any collateral. There is a drawback to Upgrade though - the company does charge origination fees, which can reach up to 6% of the loan amount. You may also be required to have free monthly cash flow of $1,000 and self-employed people typically are required to submit more documentation than others. Having said that, the company does provide loans that are easy to apply for online, with the funds provided within the same business day that verification is received. Marcus may be the new kid on the block, but the company is backed up by one of the most prestigious financial institutions in the world - Goldman Sachs. It specializes in fixed rate personal loans for people with solid credit and has plenty of options if you're looking for a long-term loan. The 660 minimum credit score may scare off some customers, as will the limit of $40,000. On the other hand, the company provides loans with APRs as low as 6.99%, payable over 3-6 years, with no origination, processing, or prepayment fees. With Marcus you can also receive your funds in as little as 48 hours, assuming you are approved for a loan. A rather unique feature of Marcus is that it allows customers to defer payment after “good behavior,” meaning that if you’ve paid on time for 12 months you can defer up to 3 payments for no extra interest. This is a useful option if you decide to take a long-term loan and your situation changes over the course of your loan. You can also configure your repayment date for any day of the month and change it up to 3 times over the term of your lolan. Typically, the shorter your loan term, the higher your monthly payments. This is offset by the fact that with a shorter term you’ll end up paying less interest by the time it’s all said and done. For instance, if you take out a $10,000 loan at 10% interest with a 2 year repayment plan, you’ll pay $461.45 per month. If you instead paid it off over the course of 5 years, the monthly payment would be only $212.47 per month. On the other hand, with the 5 year loan you’d end up paying a little over $2,700 in interest by the time it’s all paid off, as opposed to $1,074 with the 2 year plan. You may have other monthly expenses that don’t leave you the breathing room for a large loan repayment bill every month and being on the hook for some extra interest could be worth making it easier on your monthly budget. It’s a personal issue and it’s up to you to decide. This might go without saying, but typically a bigger loan takes longer to pay back. One reason to take a long-term loan is simply that you need more money and more time to pay it off. This could be for a large project like a home renovation or debt consolidation, which could help out your monthly budget by giving you a loan with better interest and APR than your current credit card debt. Sometimes taking out a high loan amount can give you a bit of sticker shock, but if you spread it out over a long enough time, you can find the monthly rate that works for you. A long-term personal loan can give you the funds needed to pay for a large expense without having to use your credit card. Personal loans tend to have interest rates ranging from 5-10%. If you took out a 5-year loan for $5000 at 5% interest you’d end up paying $5,661.37, while with a credit card with 16.71% interest, you’d end up paying $7,409 by the end of five years. What this means is that if you’re on the hook for a personal loan it can mean you’ll have much easier repayment terms, much lower interest, and you’ll also be able to keep your credit card free in case of emergencies. Personal loans usually allow you to pay more any given month if you have the funds. What this means is that while you can calibrate a monthly minimum that is easy to come up with, you’ll also want to have the option of paying extra in months that you’re flush, just to get a little ahead on the repayment. With a long-term loan, you’ll end up paying more interest overall. Higher maximum loan amounts could also tempt you to borrow and spend more than you really need, causing you to end up with higher debt. The application process for long-term loans is longer and more stringent as well, and usually, requires you to put up collateral, so aren’t good if you need cash in a hurry. The amount of money you need is a personal decision that depends totally on your expenses or any upcoming projects you’re looking to undertake. Usually its best though to only take out personal loans for things that you can expect to be able to pay back within a reasonable amount of time. This is the case even if the lending company allows you to take out far more than you need. This may be tempting, but it’s more prudent to only take what you can repay, so that you don’t go deeper into debt. You also need to take a look at the initiating fees for the loan and how that will play into the overall repayment costs. When you’re looking around at different lending houses, you may at first come across some lenders that don’t quite offer you the terms you’d like. This is not the time to get discouraged. Do some more due diligence and you should be able to find a lender that works better for you. Take a look at the interest rate, APR, repayment schedules, and also the initiating fees. All of these factors can really make a difference in living with the new loan. Once you’ve found a company that works for you, it’s time to start gathering the necessary documents. A personal loan isn’t as complicated as a mortgage, but you’ll still want to get together a number of documents, such as tax records, pay stubs, bank statements, and the like. If you for some reason get rejected, ask which criteria made the difference and make any possible adjustments before your next loan application. Long-term and short-term loans are used to cover different types of expenses. A short-term loan, as its name suggests, can quickly help you cover a sudden unexpected expense or decrease in income. It generally involves smaller amounts, has looser requirements, and will have higher interest rates. Long-term loans are more suitable for big ticket purchases that will last at least the entire life of the loan, such as a car, or boat. There are exceptions to this rule, however, and you may consider a long-term loan to pay for an expensive surgery or wedding. To qualify for a long-term loan, you generally need better credit than a short term loan. Your monthly payments can be smaller, because you're paying back the amount over a longer period of time. If you qualify, a long-term loan often will be for a bigger amount and at a lower rate. If you want to take out a long-term personal loan, first take some time to really hammer out how much you need and how much you can afford, and then start shopping around for the best personal loan company with the most favorable rates for you. This is when you’ll also decide if you’d prefer a variable or fixed interest rate. A fixed interest rate locks in the monthly payment so you always know how much you owe, but with the variable rate you can possibly see your payments drop if interest rates go down. Now that you know the facts about taking a long-term personal loan from one of the top 5 online lenders, you can choose which one is best for your situation. If you're still unsure about if you should take a personal loan, read our full guide to personal loans or read more about the top personal loan lenders on our in-depth reviews.